So, I just finished a visual novel that I played on a PSP emulator to my my Galaxy SII. I finished it in around 23 hours but I’ll replay it again as the characters are all so interesting. 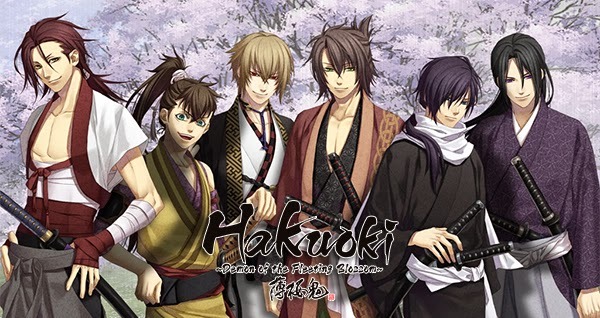 It’s called Hakuoki: Demon of the fleeting blossom, and is a sort of romantic historical visual novel with wars, samurai, blood and demons. It’s one of the only games in its kind to be directed to females, as the romantic story is from a female perspective. The story is about a young girl that comes to Kyoto, dressed like a boy to protect herself better or so she think, to search for her father that has gone missing. She’ll realize that the Shinsengumi is looking for her father as well, and she’ll be put as a sort of hostage in their care until they find him with her help. But what she also encounters that first night when she get there is beyond what she ever imagined she’d see in her life. You’ll start by naming your female character, but her last name is set already. As it is a visual novel, the game is built up by pictures and text. The story however is really nice and well written, the art is so beautiful but sadly the game has some stereotypes. The damsel part of the protagonist, the need to rescue and care for her by the boys and such. The game gives you choices throughout and certain options gives plus with the men, other do not. There are five men to choose from and if you haven’t flirted with them at all, another candidate will show that might not be expected. I couldn’t help to get special feelings for Hajime Saito and Souji Okita, but the other people in the game are just as sweet and awesome. I would have wished though that Chikage Kazama and his fellow men would have a bit more story and interaction. The romance story in the game however pulled in my heartstrings and I couldn’t help but to smile when such moments came, even though I picked the silent, brooding man as my first, the only truly romantic thing that happened, was towards the end. But I must say that after my second playthrough with Toshizo Hijikata, I actually started crying at some points, the writing is actually so good, so romantic. The game changes paths depending on what you choose, but it still keeps to the same events just from different angles. It’s a game well worth playing, and I don’t know what else to say really to not spoil the entire game so go play it, now!